I don’t have other ways to keep certain photos which had been memorable to me than to make a scrapbook page for it. It may contain one photo or more depending on the number of photos I had taken as well as the kind of layout design which I will be using to make that certain scrapbook page. Now this one was taken at Naga City in Cebu island, Philippines. It has become a city when most huge companies had started emerging on that certain area. Their port and plaza had been becoming beautiful and that people are suggesting it if one wants to spend some quality time with friends or family. Well, it was indeed beautiful and we have to capture that moment, thus this photograph was taken. 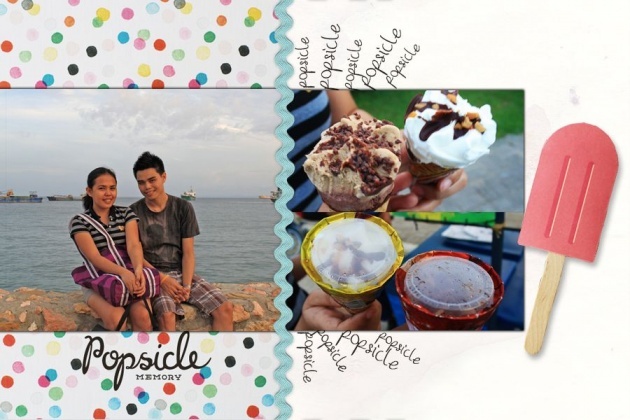 I couldn’t think of any other lay out though instead, I just made fun with some photos of the cornetto ice cream which we ate during that time. I couldn’t locate any clip art for ice cream so I instead used the popsicle one which is the only one closest to being a cold treat. thanks sir! heheh sarap talaga nyan!